Nanoparticle designs target and treat early stage cancer cells by killing those cells with heat, delivered from inside the cell itself. Normal cells are thus left unaffected by the treatment regimen. In contrast to conventional cancer therapy, a University of Cincinnati team has developed several novel designs for iron-oxide based nanoparticles that detect, diagnose and destroy cancer cells using photo-thermal therapy (PTT). 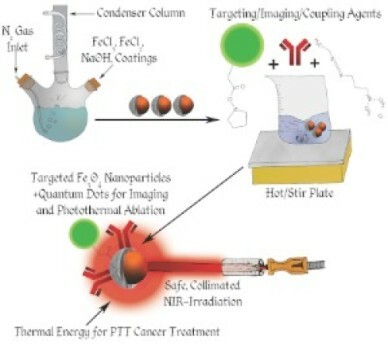 PTT uses the nanoparticles to focus light-induced heat energy only within the tumor, harming no adjacent normal cells. With this technology, a low-power laser beam is directed at the tumor where a small amount of magnetic iron-oxide nanoparticles are present, either by injecting the particles directly into the tumor or injecting them into the blood stream whereby the particles find and bind to the abnormal cancer cells via cell-specific targeting. Each tumor has a corresponding protein that is cancer specific called a tumor specific ligand or an antibody antigen reaction that only has expression for that specific cancer such as breast or prostate cancer. Scientists identify this certain bio-marker that is specific to a certain tumor, then conjugates this bio-marker on the surface of the nanocarrier that only has the expression for that specific kind of cancer cell. It then only targets the abnormal cancer cell, not normal, healthy cells, and because it is so small it can break the membrane and enter that conjugated cancer cell and release the PTT. The procedure can ultimately be carried out by the patient themselves after being trained how to direct a small laser light device to the affected area for a specified amount of time two to three times a day. Future research in nanoparticle PTT will look at toxicity, biodegradability and compatibility issues. Shi said that the team is currently looking for other diverse biodegradable materials to use for the carriers such as plant chlorophylls like those in cabbage that are both edible and photothermal.